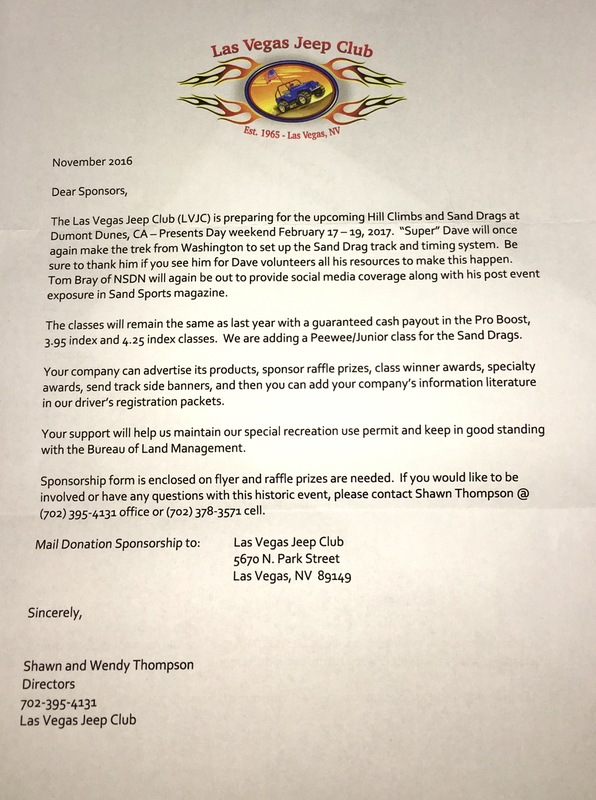 The 2019 Las Vegas Jeep Club Jamoree will take place on President's Day Weekend February 16-17 at the Dumont Dunes in California. 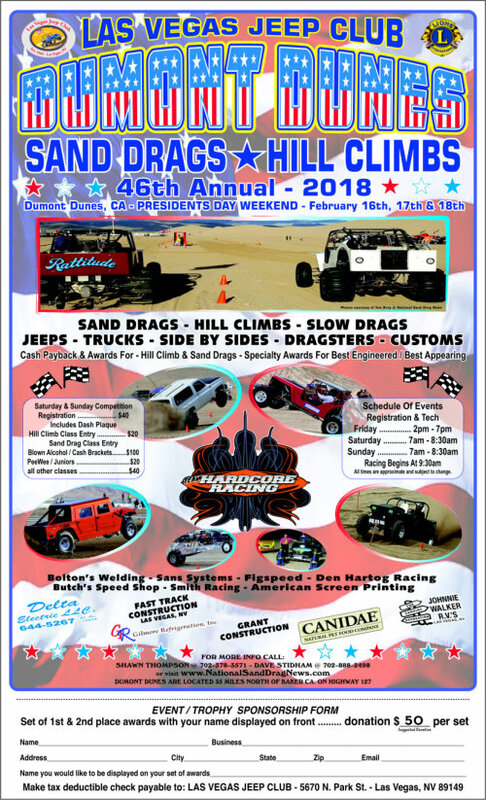 Plans are in place to run the normal format with the Hill Climbs featured on Saturday followed by the traditional 300' Sand Drag event on Sunday. Check back for more info on this event as it gets closer. As always for more info on this event, contact Shawn Thompson 702-378-3571 or Dave Stidham at 702-888-2498. 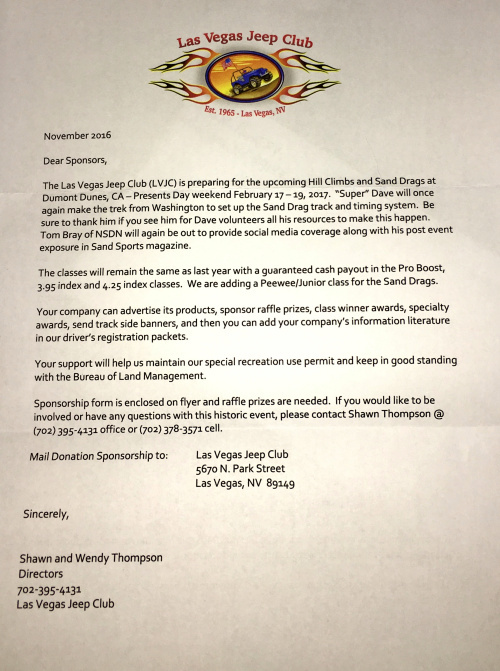 The 2018 Las Vegas Jeep Club Jamoree will take place on President's Day Weekend February 17-18 at the Dumont Dunes in California. Plans are in place to run the normal format with the Hill Climbs featured on Saturday followed by the traditional 300' Sand Drag event on Sunday. Check back for more info on this event as it gets closer. As always for more info on this event, contact Shawn Thompson 702-378-3571 or Dave Stidham at 702-888-2498. The 2017 Las Vegas Jeep Club Jamboree is coming up on President's Day Weekend February 18-19 at the Dumont Dunes in California. 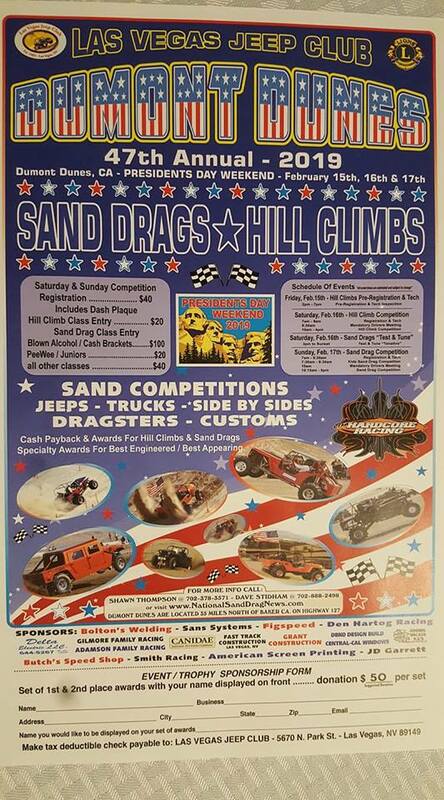 This will be another great event with the traditional Hill Climbs on Saturday & 300' Sand Drags on Sunday. 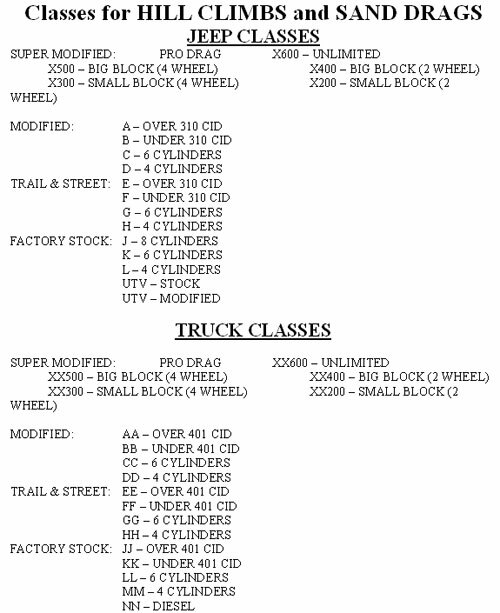 The Hill Climb event will feature a full slate of classes listed below as well as a new Slalom Hill course for the Jeeps and Trucks to compete in. 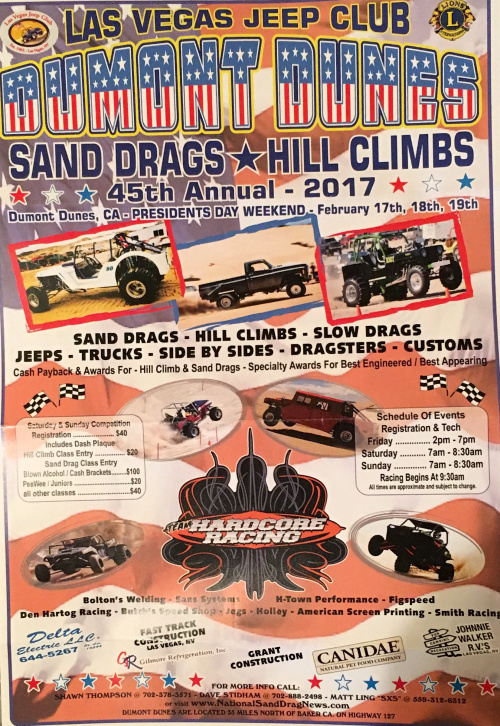 Sunday's Sand Drags will compete in the same format as the 2016 event. 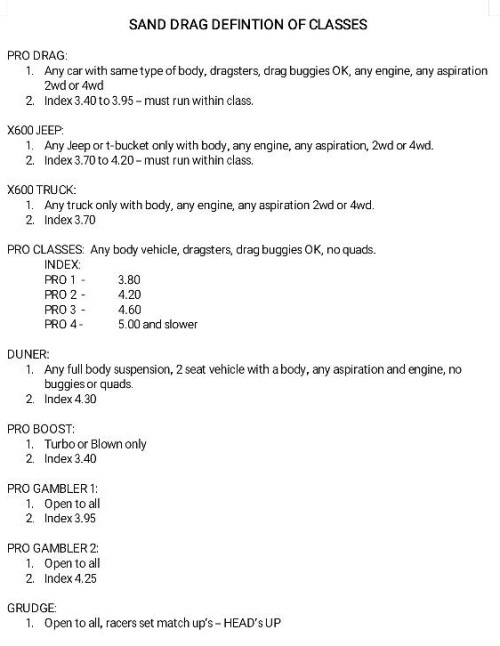 There will once again be Cash Payouts in the Pro Boost, Pro Index 1 (3.95 Index), and Pro Index 2 (4.25 Index) categories. These classes featured some incredible action last season. This is shaping up to be a great weekend of racing at the Dumont Dunes. 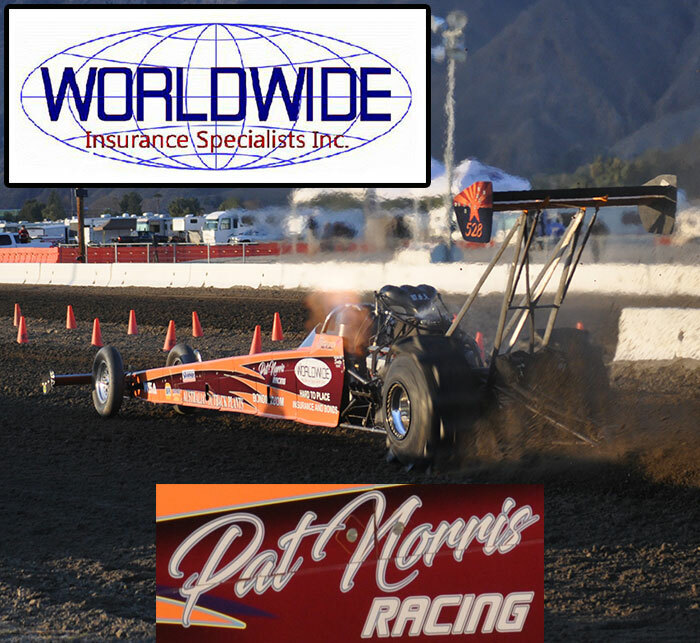 For more info on this event, contact Shawn Thompson 702-378-3571 or Dave Stidham at 702-888-2498.